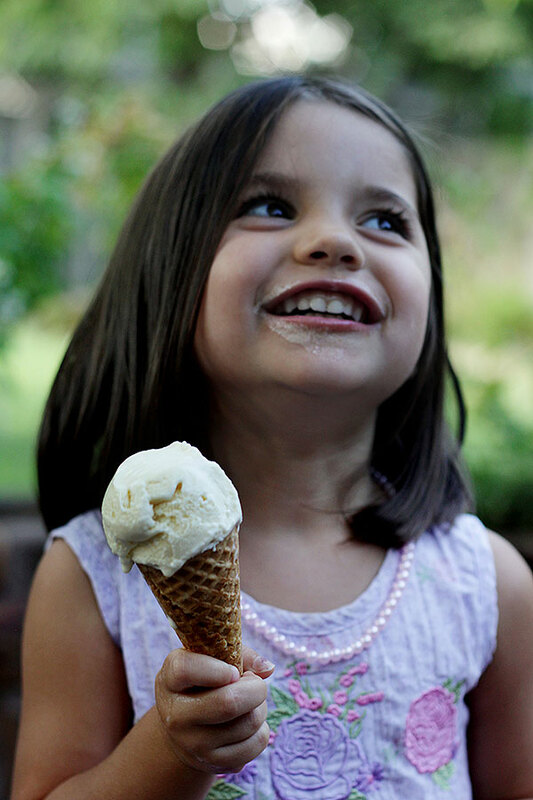 I drag the tip of my spoon along the soft white scoop and put the cold ice cream to my lips. I slip into a dream lit by exotic pine, orange, sandlewood and cream. There’s ginger in there, too. 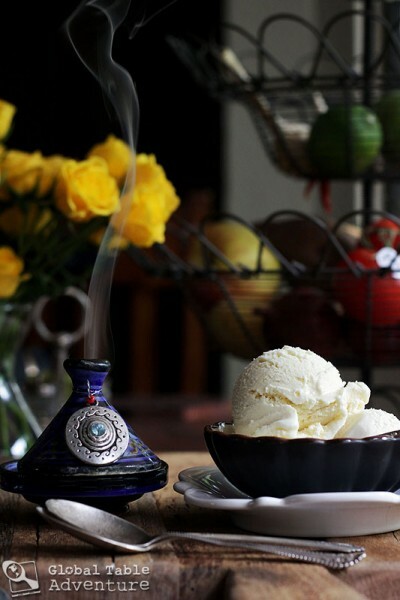 This is Frankincense Ice Cream. I look around the empty kitchen. I feel the empty house. There is silence. I shut my eyes and I am in Oman, sitting under a tree feeling nothing but absolutely… pure. When I open my eyes, the house is still empty. “It doesn’t taste like it’s going to kill me,” I whisper to a photo of Ava on the wall. Her 11-day old head is cradled in two hands: mine and Keith’s. My fingers brush across my stomach and I say a silent prayer that cramps won’t pop up hours later. As I stand there, stiff and awkward in the face of the most gloriously strange ice cream I’ve ever tried, I suddenly realize I haven’t been relaxed for a long time. It’s not really about the blog. Sure – week in and week out, there’s lots to do. At just 2/3 through cooking the world, our routine is now fairly well-orchestrated. That being said, there is a grind to the routine – a “this is now my job” feeling that both makes me feel like the luckiest girl in the world, as well as a girl with a serious responsibility – a girl who must properly and fairly celebrate each country to the best of my ability. It’s like being a mom. I want to take care of everyone, just like I want to take care of Ava. So I go on caring, even when I’m tired. Even when the house is empty and I could really use a nap. Even when I’m a little scared. Mothers always try the risky food first – just in case. After all, my child is still my child… she still crawls in our bed during thunderstorms… she still need affirmation and attention and love, like any three year-old. And I want nothing more than the best for her. 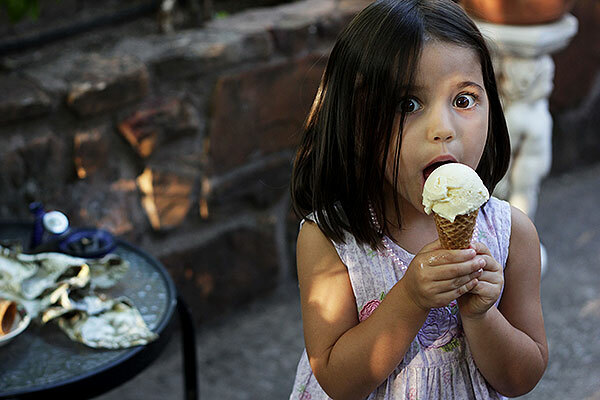 I look back at the Frankincense Ice Cream and, after one more bite (during which I try hard to push the fear away – telling myself if an entire country eats it, how sick could it make me? ), I pop the container back into the freezer. Indeed, there are no ill effects. In fact, the only thing I feel is the joy of having eaten ice cream and my own shameful nerves. Three days later I try the ice cream again. This time Keith joins me. We eat a few more bites than the first time. Neither of us are sick. I wait another few days to offer the treat to Ava and Grandma Martin just to be sure there are no latent side effects simmering below the surface. Smiling behind giant cones, they eat and enjoy. As we sit in the golden afternoon sunshine, I can’t help but wonder if everything will be okay in the biggest sense of the word. In the biggest sense of the world. I want our world to be okay. I want us to try, even when we’re scared. I want us to be curious about each other. I want us to take risks in love and life. And I worry when we become too tired and jaded and worried to try. This is what is so exhausting. This is what I felt that day in the deep, frankincense dream. Why I’m not relaxed: I never. stop. worrying. The irony is that Frankincense Ice Cream is an ordinary treat in Oman. I know there is no fear in Oman for this delightfully strange ice cream. But I worry anyway. Why? Why can’t I just trust? Are you a worrier in life, or do you dive in without fear? What is your experience with getting out of your comfort zone? I’ll take all the tips I can get. 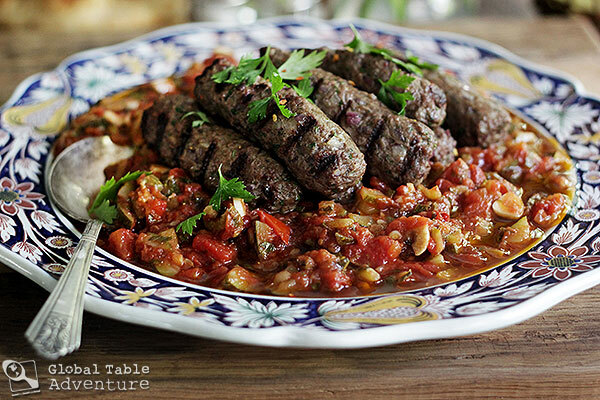 We all loved these juicy kofta. The fact that the sauce is loaded with zucchini? That’s perfection from a mother’s point of view. So healthy and the flavor – rolled up in cinnamon, coriander, and more – is just on the joyful edge of exotic. It’s also a plus that the sauce only needs to be cooked for ten minutes (although you can certainly stew it longer for a more wintery dish). I wasn’t sure the kofta in zucchini sauce was going to taste “global” enough, but I’m not sure why. It was a great global treat. Ava and Mr Picky gobbled this one up without hesitation (Ava also went crazy for the basmati rice I served it with). This will make a nice treat for many summers to come. 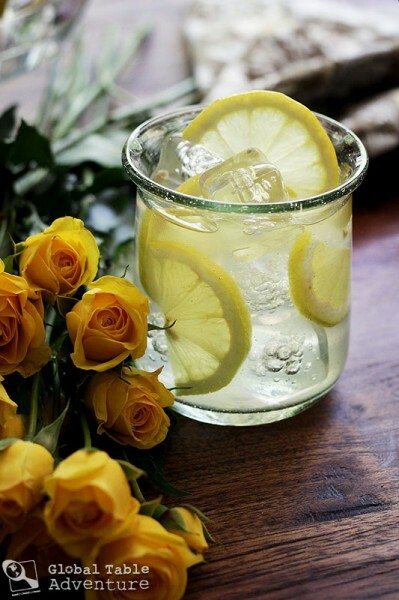 who wouldn’t want to drink a valley of roses in every sip? This is so easy if you use store-bought lemonade laced with the irreplacable flavor of fresh sliced lemons. Keith, Ava, and I enjoyed this – Ava without any questions at all. Keith said “huh” and continued to drink. To me, it seemed like a drink for a festive occasion, like a travel-themed wedding or baby shower. Nothing, although some might want to moderate how much rose water they add until they aquire a taste for it. Most people who try it for the first time have the distinct sensation they are consuming perfume. This is exotic, wild, and makes the hair stand up on my arms. Everything about this dessert says wow, amazing, and give me more. One friend, after eating it remarked “Who lit the incense?” That’s exactly what happens inside your mouth, in the most wonderful way. My biggest fear – of a “reaction” – never happened. I’m happy to report everyone enjoyed their ice cream with no side effects. “My aunt did this for a blog I kept while traveling, though she chose only a selection of entries and pictures and created a scrapbook for me. It was one of the best surprise gifts I’ve ever received. Yay, Mary! Please email me ([email protected] globaltableadventure.com) to claim your ice cream maker. Thank you all for playing along. See you at the next giveaway. My best tip for getting out of your comfort zone is to take a deep breath and “just do it”. That’s what I have to do and tell myself EVERY time. I’ve finally (at age 52) come to the realization that the worst that could happen is to fail but the best that could happen is that I’ll succeed beyond my wildest expectaions. In 1998 I was pondering over whether or not to open a scrapbook store in the little town I was living in. My dad said “I think it sounds like a good plan, I think you should do it”, so I did. A year later when I’d had a most successful year with profits way beyond what I expected, I asked why he thought it would succeed. His response was “Oh! I didn’t think it would work. But I knew you had to do something and this seemed like as good an idea as any”. Because of his confindence that I should “just go for it”, I did and I learned a valuable lesson in the meantime. Doing something is way better than the inertia of pondering or doing nothing! What a neat story Anna Clarice… we never know what we’re capable of until we try and your dad is so right – something is better than nothing! I also love that it worked out for you… so nice to have the risk pay off.